Boho A-Frame near Bromley, Stratton and Manchester. Dog Friendly! Our cozy a-frame is conveniently located between Manchester and Bromley Ski Resort on the edge of the Green Mountain National Forest. Bromley is a quick 5 minute drive, while Stratton and Magic Mountain can be reached in less than 20. Manchester has your shopping and dining needs covered, and is a short 10 minute drive away. Enjoy ample hiking and biking trails, with access to the Appalachian and Long Trails less than a mile away. The Vermont A-Frame has been thoughtfully designed with our guests comfort in mind. The first thing you'll notice about our home is the welcoming deck situated off the front of the house. It is a lovely spot to enjoy a hot cup of coffee while taking in the sights and sounds of the nature around you. The open concept living area is a classic feature of this 1960's cabin. The dining area comfortably accommodates six, and to the right, a comfortable sectional faces the field stone fireplace, and makes an ideal spot for an afternoon nap. The TV is equipped with basic cable, a DVD player, and an Amazon Fire Stick for you to easily access your Netflix or Hulu accounts. WiFi is provided, and the password can be found in our guidebook. Grab a book from the mini-library, brew a cup of tea and make yourself comfortable! Next to the couch you'll find a Crosley record player and an assortment of records for you to enjoy. The record player is also equipped with Bluetooth if you can't find a record to suit your taste. The kitchen is small, but fully equipped with new pots, pans, tableware and bakeware for all your cooking needs. The pantry and fridge provide ample storage for any dry or perishable goods. We've even sourced special amber-colored glasses straight from the sixties! 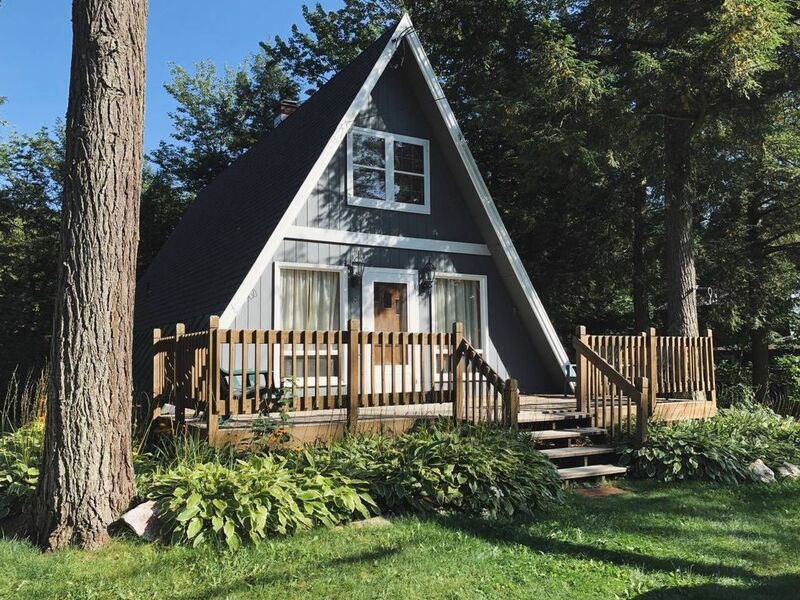 The a-frame has two bedrooms with one queen bed each, and a loft with two twin XL beds. While the loft is tucked away in privacy at the top of the stairs, please note that it does not have it's own door. Downstairs you will find the full bathroom stocked with fresh towels for each guest. A half bathroom is located upstairs in the master bedroom. Please note our pet policy, which is further explained in our house rules. We permit one dog per reservation. Other animals such as cats and birds are prohibited. Violators of this policy are subject to eviction, additional cleaning fees and loss of security deposit. Guests will have access to the house in its entirety, with the exception of one closet in the downstairs bedroom. We are available via phone or text should you have any questions or concerns during your stay. Feel free to reach out at anytime. We’re happy to chat! The water in the A-Frame is well water. While completely safe to drink (we test it regularly), some guests might find the slight metallic taste unpleasant. Because of this, we supply our guests with bottled water for their stay. Water bottles and basic spices are provided. My husband, dog, and I very much enjoyed our stay at the A frame. Cute decor, cozy space, and comfortable couch and beds. And the location was perfect - just a 5 minute drive to dining and shopping in Manchester, about 20 minutes to Stratton mountain, and 5 minutes to Bromley. The neighborhood road was very nice for walking the dog as well - just off the main highway. Monique followed up with us several times to make sure we had everything we needed before and during our visit, and was very responsive when we were setting up the reservation. Great hosts! The cabin is just off Route 11 on a street dotted with several quaint little a-frames. Please note that while there are neighbors, the A-Frame is still very much the quintessential "cabin in the woods", so please be mindful of wildlife such as raccoons, bear and deer. Although the a-frame is directly off a main road, we still recommend a vehicle with 4-wheel or all-wheel drive during the winter months.